When thinking of what to cook for Argentina, we automatically thought of this dish. Having cooked it before though, we felt that maybe we should be a little more creative and try something else, but we remembered it having been particularly tasty and were keen to eat it again. As it turned out, we were at a friend’s barbecue and he kindly allowed us to hijack the barbecue briefly to cook the steak. After cooking it, we sliced it up into strips and added more sauce so that people could share it. The beef wasn’t actually Argentinian because we couldn’t find any unfortunately. 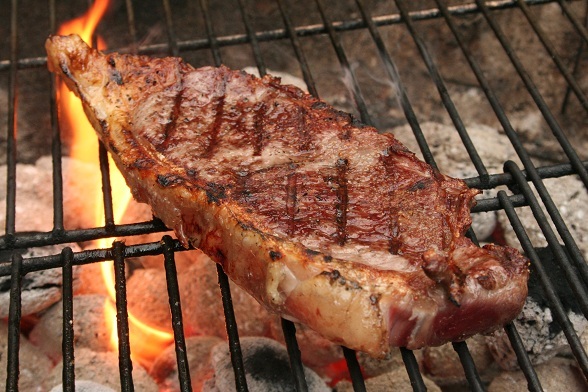 We had put it onto the barbecue first when it was still too hot to cook most things, which gave it a delicious char-grilled taste on the outside after just a few minutes, leaving the middle succulent with a slight sweetness. The sauce was a perfect match and we added it to a few other barbecued foods later on too. 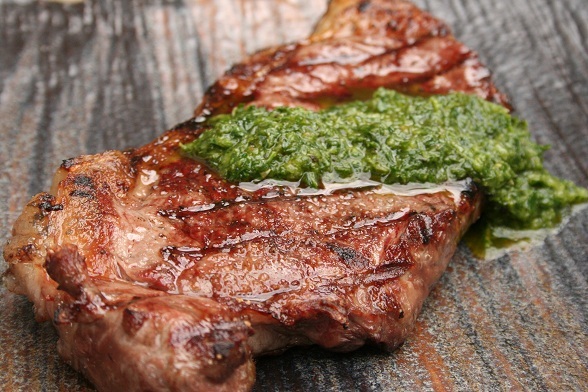 Subscribe to comments with RSS	or TrackBack to 'World Cup Cuisine – Argentinian Steak with Chimichurri Sauce'. .-= Jeanne @ CookSister!´s last blog ..Saturday Snapshots #94 =-. .-= Lizzie´s last blog ..Dim Sum in Hong Kong =-. Hi, how do you make your chimichurri?